After a five-day orbital chase, a huge robotic European cargo ship is scheduled to arrive at the International Space Station today (March 28). The European Space Agency's third Automated Transfer Vehicle (ATV-3) is slated to automatically dock to the complex this evening at around 6:32 p.m. EDT (2232 GMT), delivering roughly 7 tons of supplies for the crew of the orbiting outpost. The ATV-3 launched into space on March 23 from Europe's South America-based spaceport in Kourou, French Guiana. Over the past several days, as the cargo ship chases the space station in orbit, some lucky skywatchers around the world have been able to snap photos of the ATV-3 from Earth as it sailed overhead. The unmanned cargo freighter is carrying the heaviest load ever delivered to the space station by a robotic spacecraft, officials from the European Space Agency (ESA) said in a statement. On Friday, March 23, 2012, Ariane 5 VA205 with the third Automated Transfer Vehicle Edoardo Amaldi lifted off from Europe's Spaceport in French Guiana. The ATV is designed to automatically dock to the Zvezda module on the Russian segment of the International Space Station. The disposable cargo ships remain attached to the complex for up to six months before they are filled with garbage and deliberately sent to burn up during atmospheric re-entry. The ATV-3 is nicknamed "Edoardo Amaldi" after the celebrated Italian physicist who helped unify Europe's spacefaring efforts under what is now the European Space Agency. Amaldi is also one of the founding fathers of CERN, the particle physics laboratory along the Swiss-French border that houses the Large Hadron Collider. The ATV vehicles are routinely named after historical figures in astronomy or space exploration. ESA's first ATV was named Jules Verne, and made its maiden voyage to the space station in 2008. The agency's ATV-2, Johannes Kepler, successfully followed in 2011. The ATVs are part of an international fleet of disposable, unmanned cargo ships that are used to carry supplies and hardware to the space station. Several other spacecraft, including Russia's robotic Progress ships and Japan's H-2 Transfer Vehicles (HTVs) also regularly make trips to the orbiting outpost. 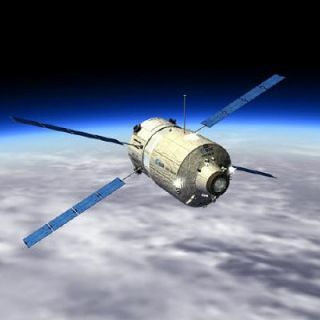 The docking of the ATV-3 will be streamed live on the European Space Agency's website beginning at 6 p.m. EDT (2200 GMT). Additional details about the docking timeline are also available on ESA's ATV blog.